Horizon Zero Dawn appeared unique from the start – a PlayStation 4 exclusive, a novel setting, with an all-new franchise, combining survival game elements with cover shooter mechanics and real-time strategy play, all while you hunt mechanized dinosaurs in a lush, natural setting. A game with that kind of apparent quirk could go one of two ways – luckily, this one ends up being fairly amazing. The game’s success is owed partly to its effective replication of the feel of previous successes, including Far Cry Primal, but also to its fresh story, beautiful visuals, strong character acting and strong story telling. 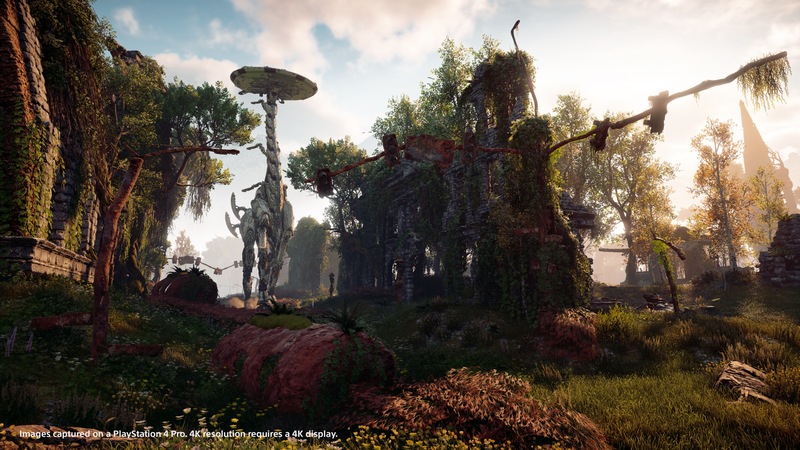 Horizon Zero Dawn also has conversation trees and a narrative side-questing and main quest system that feels like a BioWare games at times, albeit with a little less emphasis on the talking, which those games tend to draw out too long anyway. One of the game’s biggest strengths is in how effectively it establishes the world in which you play as protagonist Aloy, and how well it does suggesting the past that resulted in this world, and then teasing out the story of how things came to be this way. Guerrilla Games has nailed the creation of a brand new fictional world, which is no easy feat when it’s a brand new property, and the game is as large and engrossing as is Horizon Zero Dawn. The key ingredient here is believability: Horizon’s game world feels like a naturally occurring environment, which makes its own kind of internal sense even from the first moment you see a robotic bipedal beast stalking the plains with a single spotlight glowing where its eyes should be. This blends seamlessly with a society that also depends on bows and arrows, and that lives in rudimentary huts – and with the lush, natural setting that provides the open world environment, complete with roving small game and harvestable flora. A big part of why the world feels so natural is how well it’s depicted the fall of modern society in buildings, ruins and other details of set dressing dotting the landscape. The span of time that’s resulted in things being the way they are is really well conveyed in these details, and though the game is also dotted with data banks, audio files and other information that provide more explicit info about what happened to make things the way they are, the reason it all works is because the evidence is all around you, built into every detail of the stunning in-game visuals. 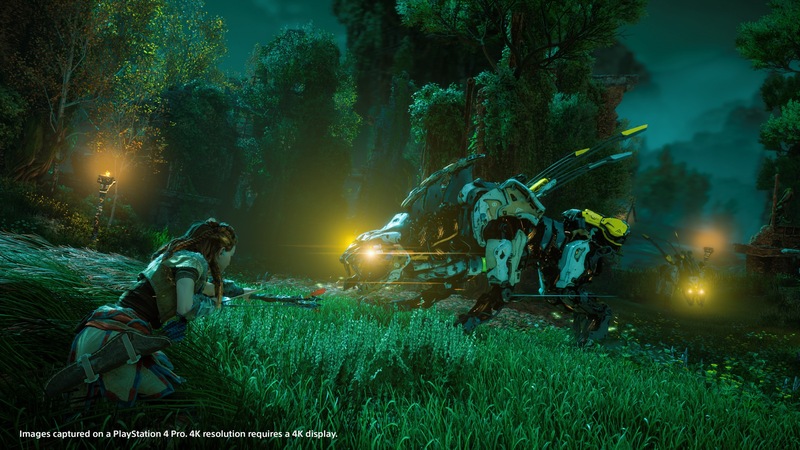 Aside from being a rich visual treat with an excellent setting and in-game environment, Horizon Zero Dawn also nails its main gameplay mechanics, through a complex hunting, weapons and skill system that players can use in a variety of ways to get through the task of hunting the wild robots that stalk the landscape, take down human opponents, and generally progress through the game’s story and side quests. Hunting groups and individual mechanical beasts is a core task in Horizon, since you gain experience from this, and will also loot key components that you need to upgrade your equipment, increase ammo capacity and build replacement arrows and other munitions. A skill tree with unlocks as you level your character allows you to acquire abilities that let you tailor your in-game style to a variety of approaches, including more direct confrontation, or more subtle, stealth-based approaches to completing your hunts. The possibilities are nearly endless when you combine skills with the various weapons you can acquire in the game, along with a flexible outfit system that helps you protect against different kinds of abilities and offensive capabilities your enemies possess. It’s a terrific implementation of a combat/hunt system that could easily be so complex that it satisfies no one – and instead it comes off as a system that will truly appeal to just about any kind of gamer. What Horizon Zero Dawn manages to do is build a whole lot of joy into even the simplest random encounter with a group of grazing robotic animals, independent of story arcs or even acquiring any particular loot. That’s the key to its overall success: Nothing in the game feels like a chore, and you’re likely to want to stop, plan out and execute a hunt whenever you come across the game’s abundant mechanical fauna, even if you don’t have any particular goal in mind when doing so. Horizon Zero Dawn is a single-player affair, and it actually doesn’t have any multiplayer elements or even plans to introduce those in the future. The game’s focus on the single player experience shows in how well it executes on those elements, as described above, and it’s to Guerrilla Games’ credit that they have kept the four on creating the best possible single-player game they could. The solo gameplay also makes total sense given the story arc and characterization of Aloy, the protagonist, and while you could imagine some amazing co-op opportunities with larger hunts on groups of mechanical animals, I’m glad they stayed laser focused on your single player experience. Plus, this is very much a game focused on establishing a universe – you can easily imagine them introducing co-op multiplayer modes down the line, but it’s not something that was necessary here, and Guerrilla did a lot of other work here that will make any attempts to introduce multiplayer better in future instalments. Another thing Horizon Zero Dawn does is provide enough material to keep you satisfied, which is terrific since it nailed virtually every other aspect. This is a game you want to play for as long as possible, and quickly there’s plenty of material to make your potential time spent in-game very long indeed. A combination of challenges, errands, side quests and main quests, along with unlockables, makes this a very engrossing game that you can spend many days with, even leaving aside how fun it can be to just jump in and test out different hunting methods on random groups of enemies with no particular goal in mind. The main storyline is also incredibly deep, and something that’s worth taking very slowly, since it’s well-crafted and full of details that very much do flesh out the primary narrative. This is a game that combines replayability with plenty of narrative options outside the main storyline, and yet it also manages to never make side-quests or challenges like taking over bandit outposts feel too repetitive or like they’re chores included to pad out the possible hours. It’s a very tight line to walk, and Horizon Zero Dawn does it very well despite also nailing basic gameplay mechanics and getting virtually everything else right, too. Horizon Zero Dawn is that rare gem: A brand new video game property in its debut title that both succeeds on its own, and that sets up what should be a very rewarding franchise for Guerrilla Games and for players. 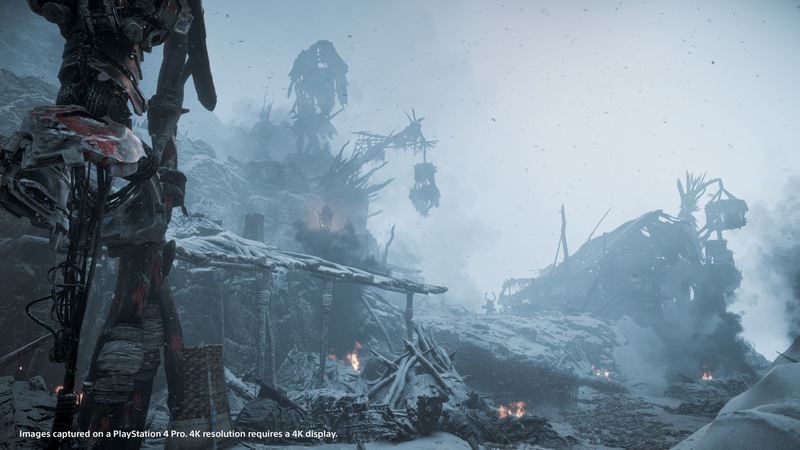 It’s a stunning visual treat, both on regular PS4 and on PlayStation 4 Pro, as I’ve found, with significant advantages on the Pro console (from which the screens throughout this article are taken). PlayStation has a real triumph on its hand here, and if you’re a PS4 owner of any kind, you should play this game. Horizon Zero Dawn comes out February 28, via digital download and Blu-Ray disc for PlayStation 4.